A beautiful hike through the forest that ends at a cool freshwater pool fed by a waterfall. There are several places to jump off the surrounding cliffs, and so long as you land in the middle, it’s always deep enough. It is located between Kaneohe and Kailua on the Southeast side. 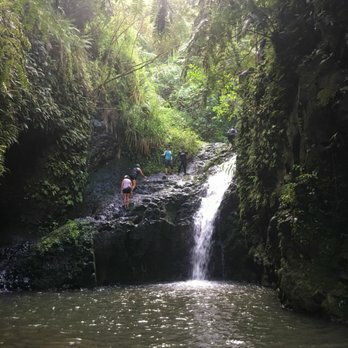 Check out this and tons of other Oahu hikes at Merlin & Friends Hawaiian Adventure Site. If you’re going to go spend an evening in town anyways, you might as well get there a bit earlier and get some waves amidst the other 500 people at the birthplace of surfing. You can rent 12-foot soft-tops for $10 on the beach and catch small waves for hundreds of yards, along with acrobats, dogs, canoes, and anything and everything else. 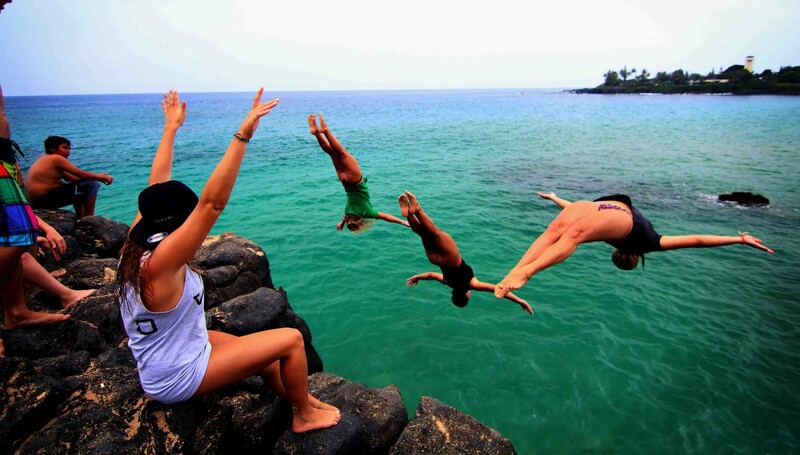 Wherever you are, there will be somewhere nearby to jump off a cliff into the ocean for an exciting addition to your trip. If you want to stick with the crowds and impress others, stick to the rock in Waimea Bay on the North Shore. If you want to be secluded and jump the same cliff seen in the movie Forgetting Sarah Marshall, jump off Laie Point in Laie, on the right side as soon as the houses end. And for a big one, go to Spitting Caves on the Southeast side, and jump off a 60-footer. A perfectly built cement skatepark right across the street from Rockpiles on the North Shore. This place is super mellow during the day, but crowded in the evenings. The locals are friendly and the park is fun so bring your skateboard on your trip. This is only a small list of Oahu activities you can do besides surf. There are so many other things to do and sites to see that it’ll take you several visits to do them all. I have been here numerous times throughout my life, and even after living here the past year, there is still so much more on my list of things to do. So although the surf will most likely be incredible, you should always have a backup plan so you can make the most of your trip when the waves aren’t so good.